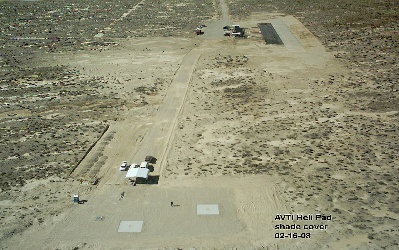 The AVTI Airpark is located in the Antelope Valley on 10th St. East (Challenger Way), between Avenues F and G just north of Lancaster, California. The Airpark coordinates are 34°44.738 North and 118°06.537 West. The field elevation is 2326 feet. We maintain a flying site with a 600' by 40' concrete runway, graded and graveled entrance road, paved pit area, taxiways and pilot stations. The pit area has a sun shade, with ample room to accommodate numerous pilots and their models. 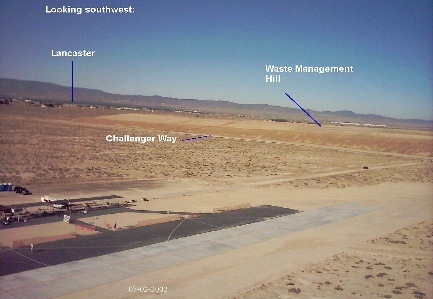 The runway has an E-W orientation with wind predominantly blowing from the west. Extensive parking and several portable sanitary facilities are permanently available. The airpark is gated and may be used at any time by its members and guests. Spectators are always welcome when the field is in use. Our flying site is host to several local and regional organized events throughout the year for the enjoyment of both the modelers and the general public.